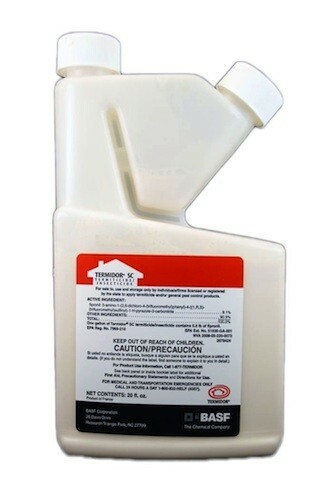 PRODUCT DESCRIPTION: Termidor is the #1 termiticide in the United States. Its non-repellent chemical technology is the best way to treat both termites and ants. WHERE TO USE IT: Around Homes both Inside and Out. RATE OF APPLICATION: This product has multiple rates. The lessor rate is to add .8 oz of Termidor to one gallon of water. At this mixture, you will get 25 gallons of finished product which can be used to treat 62.5 linear feet. For the middle rate, use 1.2 oz of Termidor per gallon of water. This will yield 16.66 gallons of finished product which can be used to effectively treat 41.65 linear feet. The highest rate is to mix 1.6 oz of Termidor per gallon of water. This rate will yield 12.5 gallons of finished product and be able to effectively treat 31.5 linear feet. Very impressed with this product. I had ants marching all around my patio. Mixed the product to the middle dosage and applied one time. For two weeks, I haven't seen a single ant in the areas I sprayed.